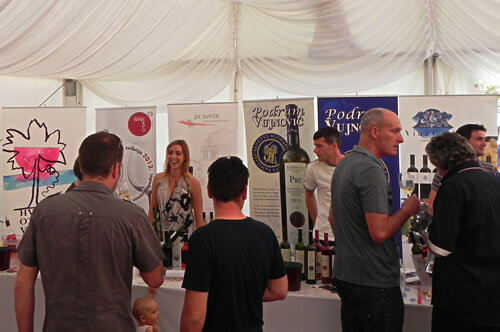 Having missed the Dalmacija Wine Expo last year, we were keen to book early for this year. 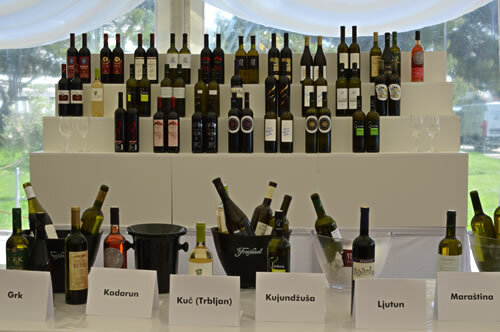 It’s the best place to try a range of Dalmatian wines, and find out what’s new and compare the various offerings. We set ourselves up with a room in the hotel right next to where the Expo is held, and showed up for the Friday opening on May 3rd. But… hey, where’s the tent? 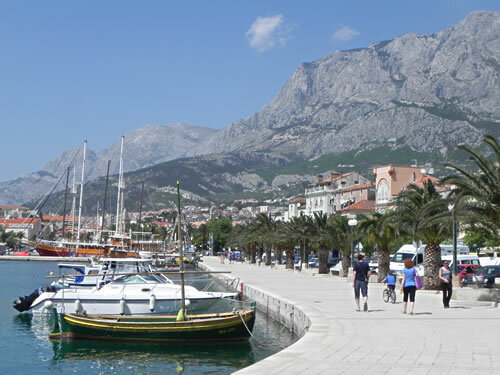 Fooled by the photos on the DWE website, we had assumed it would be held at the Hotel Osejava again, but no, we ended up having a walk along the lovely Makarska waterfront to get to it. So much for carefully laid plans! The Expo for 2013 seemed bigger than before, not so much in the number of wineries attending, but in the amount of space for visitors, and the other produce on show. It was also rather hot inside the tent, with many wineries opting to put their red wine bottles in iced water, not just the white wine. I understand it was even hotter on the Saturday! That’s an impressive 25 different varieties, and what, no Parč? Oops, I do believe they missed one! It’s really good to see such diversity in wine is still alive and kicking. I do hope that joining the EU doesn’t stifle many of them as being non-standard. These grape varieties are very specialised for their growing conditions – the terroir and microclimates that vary so widely here. So I learned that I really enjoy Babić. It’s a lighter red than Plavac, and goes extremely well with fish as an alternative to drinking white. The Darnekuša, on the other hand, is on the darker and deeper side of the reds. The various versions of Plavac are fairly similar, although to a trained palette there may be clear differences, not to me there wasn’t! Several of the Hvar winemakers were there, pouring their latest offerings. In view of the current controversy about prošek, I was interested to try as many as I could find. Although I’m not expecting it to disappear off the shelves anytime soon, I wanted to see who produces a really good traditional version. In case you’ve not been following the Croatian press, it’s one of those niggling EU accession issues that’s getting the Dalmatians all fired up in defense of their favourite dessert wine. 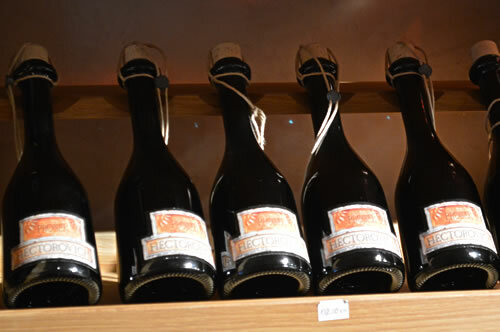 The trouble appears to be that the Italians have their prosecco (pronounced pro-sekko), a light sparkling wine, and everyone thinks it would be too confusing to allow the Croatians to sell their prošek (pronounced pro-shek). Time will tell, but I for one would keep the prošek and lose the prosecco! So anyway, there were a few examples of a traditionally made prošek, ie starting with dried grapes and allowing to age in a barrel. My absolute favourite was Tomić’s Hektorovich, so good I had to keep going back to get more! It’s a lovely orange colour, very fragrant, and tastes of figs and orange peel and sunshine. Goes well with any dessert, and especially with blue cheese – that’s Andro Tomić’s own recommendation! The Plenković prošek was also rather good, and ran the Hektorovich a close second. 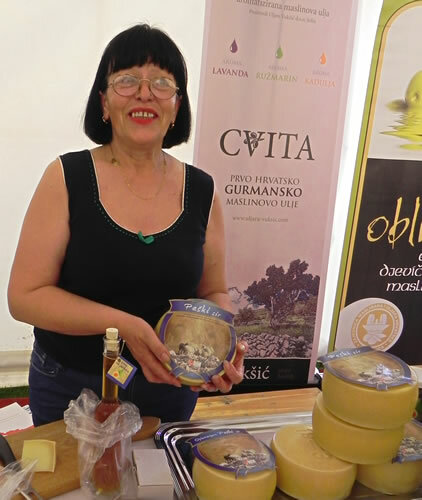 Moving on from the wines, there was also a good selection of olive oils, cheeses, fruit wines and liqueurs. Pag cheese is always excellent with wine, and I also enjoyed the olive oil tasting, with sage, lavender and rosemary, and the syrup of figs poured over little cakes.